The late and great “King of Rock and Roll,” Elvis Presley, would have celebrated his 80th birthday today. To commemorate the occasion, Legacy Recordings has released Elvis’s Complete ’60s Albums Collection Vol. 1 on iTunes, reports Rolling Stone. A brand-new site entitled ElvisTheMusic.com, with the King’s extensive discography and upcoming news, went live today. Superfans with chunks of change can also bid on one of his former private planes in an auction starting in February, but you can’t fly them anywhere. The rockabilly renegade died at his Graceland estate in Memphis, Tennessee, in 1977, reportedly from a drug-induced cardiac arrhythmia, but many believe this isn’t the whole story. The autopsy report was sealed by the King’s father, Vernon Presley, until 2027 (on the 50-year anniversary of his death). In 2010, his friend and former personal physician, Dr. George Nichopoulous, said he believed chronic constipation, not a cardiac arrhythmia, is what dethroned the King. The secrecy surrounding the autopsy has led conspiracy theorists to proclaim that the King is still alive, citing the curious different spelling of his middle name on his gravestone, him reportedly cutting family members out of his will shortly before his death, and photos of Elvis lying in his casket that the National Enquirer ran after they cut a deal with Elvis’s cousin as reasons to doubt his death. Some say he faked his death and now goes by the name Jon Burrows, a fellow who resembled the King and supposedly purchased a plane ticket from Memphis to Buenos Aires, Argentina, the day after Elvis was proclaimed dead. Or, he went by the name Jimmy Ellis and actually died in the 1990s . Others claimed to have even seen him in the flesh. In 1988, a Missouri woman named Louise Welling insisted that she and her daughter had seen Presley at two separate places, once at a Burger King in downtown Kalamazoo, Michigan, and again at the Felpausch supermarket in Vicksburg, Mississippi. This triggered a slew of people claiming they had seen Elvis in a Las Vegas parking lot, sweeping up floors in Stockholm and even hocking unofficial T-shirts outside a London Oasis show in 2002. Books galore have been published about the Elvis conspiracy too, including one to be published later next month entitled Elvis Is Alive. TV actor and Presley pal Bill Bixby hosted two television programs dedicated to unpacking the myth of Elvis, The Elvis Files (1990) and The Elvis Conspiracy (1992), which suggest that Presley went into the federal Witness Protection Program after he took part in a sting operation and feared fatal backlash from the Mafia, or that he faked his own death to rake in post-mortem cash. Bixby, who died a year after the program aired, may have been on to something: the Presley estate is making far more money in wake of the King’s death than in life, an estimated $55 million in 2011. 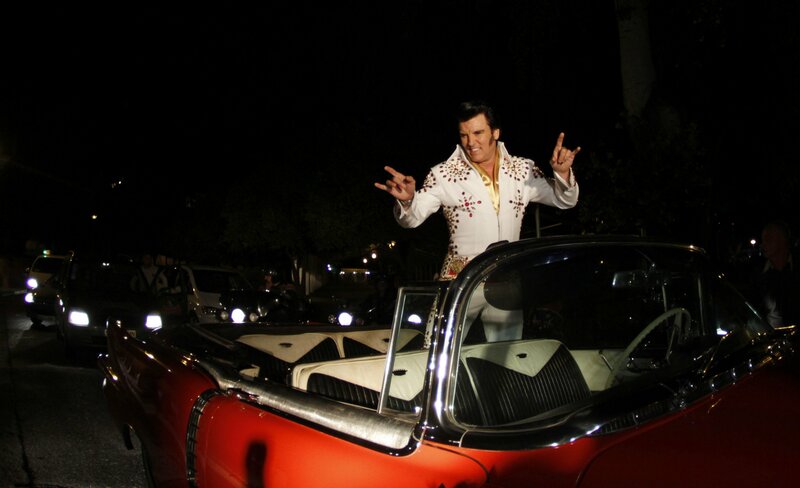 Whether you believe the conspiracy theories or not, the myth of Elvis lives on. So raise your fried peanut butter and banana sandwiches high today, put on “Blue Suede Shoes,” and keep an eye out for any coifed fellows with characteristic Mississippi drawls and gold lamé suits on. You never know. This Post was posted in Conspiracy and tagged conspiracy theories, elvis, elvis presley alive, elvis presley death, the king. Bookmark the permalink.